Start off your visit on the 30th (Mon): take in the architecture and atmosphere at Akureyrarkirkja, admire the natural beauty at Arctic Botanical Gardens (Lystigardurinn), then look for all kinds of wild species at Wildlife Areas, and finally get interesting insight from Tours. To see photos, reviews, traveler tips, and more tourist information, you can read our Akureyri trip planner. Cincinnati, USA to Akureyri is an approximately 17-hour flight. Traveling from Cincinnati to Akureyri, you'll lose 5 hours due to the time zone difference. Traveling from Cincinnati in September, expect nights in Akureyri to be slightly colder, around 40°F, while days are cooler, around 52°F. Finish your sightseeing early on the 30th (Mon) so you can drive to Reykjahlid. On the 1st (Tue), explore the striking landscape at Mud Pots, take in the natural beauty of Hverarond, and then take in the awesome beauty at Mt. Namafjall (Namaskard). 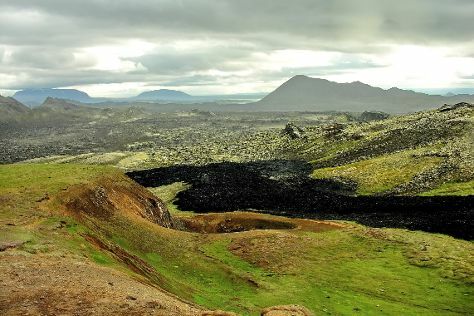 On the 2nd (Wed), you'll have a packed day of sightseeing: don't miss a visit to Viti Crater, look for all kinds of wild species at Krafla Lava Fields, then take in the dramatic natural features at Dimmuborgir Lava Formations, and finally admire the sheer force of Hverfjall. To see ratings, maps, where to stay, and other tourist information, go to the Reykjahlid trip itinerary builder . Traveling by car from Akureyri to Reykjahlid takes 1.5 hours. Alternatively, you can take a bus. Expect a daytime high around 52°F in September, and nighttime lows around 40°F. Wrap up your sightseeing on the 2nd (Wed) to allow time to travel to Hof. Start off your visit on the 3rd (Thu): explore the activities along Fjallsarlon Iceberg Lagoon, explore the activities along Jokulsarlon Lagoon, kick back and relax at Diamond Beach, then explore the activities along Lac Polaire, and finally take in the dramatic scenery at Svartifoss Waterfall. To find more things to do, ratings, maps, and tourist information, refer to the Hof itinerary builder site . You can drive from Reykjahlid to Hof in 6 hours. Traveling from Reykjahlid in October, expect somewhat warmer with lows of 39°F in Hof. Finish up your sightseeing early on the 3rd (Thu) so you can travel to Vik. Kick off your visit on the 4th (Fri): kick back and relax at Black Sand Beach, look for gifts at Wool Gallery Vik i Myrdal, then explore the striking landscape at Sólheimajökulll, and finally explore the striking landscape at Mýrdalsjökull. To find traveler tips, where to stay, more things to do, and tourist information, go to the Vik trip planner. Getting from Hof to Vik by car takes about 2 hours. In October, daytime highs in Vik are 45°F, while nighttime lows are 41°F. Wrap up your sightseeing on the 4th (Fri) early enough to drive to Reykjavik. Kick off your visit on the 5th (Sat): witness a stunning natural landmark at Reykjadalur Hot Springs and then push the limits with an extreme tour. Get ready for a full day of sightseeing on the next day: stroll through Nautholsvik Geothermal Beach, explore the activities along Lake Tjornin, and then take in the architecture and atmosphere at Hallgrimskirkja. For maps, photos, other places to visit, and tourist information, read our Reykjavik tour itinerary app . Drive from Vik to Reykjavik in 2.5 hours. Alternatively, you can take a bus. Expect a daytime high around 46°F in October, and nighttime lows around 37°F. Cap off your sightseeing on the 6th (Sun) early enough to travel back home.